This protocol provides step-by-step guidelines for setting up competitive mouse bone marrow transplant experiments to study hematopoietic stem/progenitor cell function without prior purification of stem cells by cell sorting. Kwarteng, E. O., Heinonen, K. M. Competitive Transplants to Evaluate Hematopoietic Stem Cell Fitness. J. Vis. Exp. (114), e54345, doi:10.3791/54345 (2016). The gold standard definition of a hematopoietic stem cell (HSC) is a cell that when transferred into an irradiated recipient will have the ability to reestablish blood cell production for the lifespan of the recipient. This protocol explains how to set up a functional assay to compare the HSC capacities of two different populations of cells, such as bone marrow from mice of two different genotypes, and how to analyze the recipient mice by flow cytometry. The protocol uses HSC equivalents rather than cell sorting for standardization and discusses the advantages and disadvantages of both approaches. We further discuss different variations to the basic protocol, including serial transplants, limiting dilution assays, homing assays and non-competitive transplants, including the advantages and preferred uses of these varied approaches. These assays are central for the study of HSC function and could be used not only for the investigation of fundamental HSC intrinsic aspects of biology but also for the development of preclinical assays for bone marrow transplant and HSC expansion in culture. Hematopoiesis is a regenerative process that ensures the replenishing of blood cells that have been lost through injury, radiation and cell death. This process is ensured by hematopoietic stem cells (HSC) that largely reside in the adult bone marrow. In addition, hematopoietic stem cells can be used for therapeutic purposes in autoimmune disorders, hematological malignancies and immunodeficiencies1. There is thus a need to better understand the mechanisms that regulate HSC function, including their proliferative expansion and their ability to reach and engraft the recipient bone marrow after transplant. Although recent studies have reported several cell surface markers, including the SLAM family members CD150 and CD48, to prospectively enrich adult HSCs and fetal HSCs to approximately 50% purity2-4, the gold standard measure for functional HSCs remains an in vivo repopulating assay to determine their ability to re-establish blood cell production in an irradiated host5. The in vivo clonal repopulating assay was initially developed by Till and McCulloch6 and has since been refined and expanded. As originally defined, HSCs ensure lifelong blood cell production through self-renewal and differentiation. The transfer of HSCs into an irradiated recipient thus allows us to assess: their ability to differentiate through the analysis of the different blood cell lineages (T lymphocytes, B lymphocytes, granulocytes, monocytes) and their capacity for self-renewal through serial transplantation. The assay would usually involve the comparison of the functionality and/or quantity of two populations of HSCs, e.g., cells coming from two mice of different genotypes or cells that have been treated or untreated with different factors that could influence the maintenance or expansion of HSCs in culture. Donor chimerism, or the contribution of transferred donor HSCs to blood cell production can then be determined by flow cytometry analysis in the peripheral blood and bone marrow using cell surface markers or other methods that will distinguish donor cells from the recipient, or host. The most widely used markers are certainly the two alleles for the gene Ptprc or CD45 leukocyte antigen7 that we have chosen for the examples provided below. The clonal repopulation assay can be either competitive or non-competitive. In a non-competitive setting, control and test HSCs are transferred into separate recipient mice and the outcome for each cell type will be independent of the other. In a competitive setting, the function of both test and control HSCs is measured against a population of competitor HSCs. The protocol described here uses the competitive setting but can also be adapted for non-competitive situations. Both approaches have their advantages and limitations, and we will compare them in detail in the discussion. We also describe different approaches to ensure equity in the number of transplanted HSCs, explain how to adapt the assay for the quantification of HSCs by limiting dilution assay (LDA), and provide examples of both successful and unsuccessful transplants for the interpretation of results. All procedures described in this protocol have been approved by the institutional animal ethics committee and follow the Canadian Council on Animal Care guidelines. Note: To maintain sterile/specific pathogen-free housing conditions, conduct all procedures involving direct handling of live mice inside a biological safety cabinet or a laminar flow hood. Clean or sterilize cages, restraining devices, housing materials, chow and water provided to the animals appropriately. Use only sterile, disposable needles for the injections and for blood sampling. Aseptic technique is crucial during preparation of the graft. Identify recipient mice with ear notches (or other method approved by the local animal ethics committee8) to enable individual follow up of peripheral blood and bone marrow reconstitution over time. Weigh the mice for post-transplant follow-up. Use recipient mice that are between 7 and 12 weeks old (less than 25 g). Note: In the provided example, CD45.1+ CD45.2+ recipient mice were bred in house by crossing C57Bl/6 mice with congenic B6.SJL mice. Irradiate recipient mice with two doses of 450 rad to destroy hematopoietic activity. Give the first dose the day before transplantation and the second 1-2 hr before transplantation. Note: X-ray or gamma rays can both be used depending on the availability of appropriate facilities. Euthanize donor (test and control; CD45.2+) and competitor (CD45.1+; B6.SJL) mice by CO2 asphyxiation followed by cervical dislocation or using methods approved by the local animal ethics committee. Place mice on their back, legs open wide, in an empty petri dish or on a sterile gauze (to keep the work surface clean) inside a biological safety cabinet. Wet the skin and fur with 70% ethanol/30% H2O (v/v). Cut off the foot with a surgical blade or sharp scissors. Cut open the skin along the leg and pull away the skin using serrated forceps. Cut away excess muscle. Dislocate femur by pulling on the leg bone and using scissor blades against the pelvic bones as a counter force. Detach tibia and femur from the kneecap and remove remaining bits of muscle and tendons. Place the bones in 2-3 ml sterile phosphate buffered saline (PBS) in a 6-well tissue culture plate. Collect bone marrow cells by flushing the bones with 5 ml sterile PBS. Hold the bone gently with forceps and insert a 25 G needle attached to a filled 1 ml syringe to one end of the bone. Press the plunger and collect the cells in a 15 ml conical tube. Repeat as needed until the center of the bone is white. Dissociate the cells by repeated passing through the needle to obtain a single cell suspension. Avoid bubbles and excess force. Note: Use a slightly larger needle (22 G) to improve cell viability at this step. Pass the cells through a 70 µm nylon strainer to ensure uniform cell suspension and to remove debris and clumps. Remove an aliquot for cell counting using a hemocytometer. Centrifuge the remaining cell suspension at 200 x g for 5 min at 4 °C. Readjust cell density as required in sterile PBS (108 cells/ml). Keep the cells on ice. Transfer the equivalent of 3 x 106 cells (30 µl) into a 5 ml round bottom polystyrene tube for flow cytometry staining. Add an equal volume of unlabeled antibody against CD16/CD32 to block non-specific staining (diluted in staining buffer (PBS supplemented with 0.1% bovine serum albumin (BSA) and 1 mM EDTA) for a final concentration of 2.5 µg/ml). Incubate 5 min at RT. Add 90 µl fluorochrome-conjugated antibody master mix prepared in staining buffer: biotinylated Lineage cocktail (B220, CD3e, CD11b, GR1, Ter119), Sca1, CD117, CD135, CD150. Incubate on ice for 30 min, protected from light. Note: Appropriate dilutions should be determined for each lot of antibody. See Table of Materials for dilutions used in this study. Add 2 ml staining buffer to the cells, vortex and centrifuge at 200 x g for 5 min at 4 °C to remove unbound antibody. Decant supernatant and resuspend pellet by flicking. Add 10 µl fluorochrome-conjugated streptavidin diluted in staining buffer (see Materials Table). Incubate on ice for 20 min, protected from light. Wash as in step 3.3 to remove unbound streptavidin. Acquire the cell samples using a flow cytometer with at least six detectors9. Determine the frequency of Lin- Sca1+ CD117+ CD135- CD150+ cells (estimated HSCs) in each sample using the analysis template shown in Figure 2 and as previously reported10,11. Note: The frequency of functional HSCs within that population can be estimated between 1/3 and 1/52,12. Establish estimated HSC equivalents for all samples11, using one sample (typically, the competitor, B6.SJL CD45.1+ in this example) as baseline as detailed below and in Figure 2. #transplanted HSCs / recipient = 5 x 105 cells x estimated HSC frequency (as determined for baseline sample; this number is usually between 75 and 125 for wildtype C57Bl/6 mice)10-12. Note: In Figure 2, for Sample A, the result is 139 HSCs. total # transplanted cells (for other samples; e.g. Sample B in Figure 2) = # transplanted HSCs/HSC frequency. Note: In Figure 2, for Sample B, the result is 197,826 (or approximately 2 x 105) total bone marrow cells. Calculate the total numbers of cells required per graft recipient for each sample using the results obtained above. Note: This number should be 5 x 105 for the baseline sample (competitor). Multiply the number obtained from step 3.7 by the number of recipient mice and add enough cells for at least two additional mice to compensate for the dead volume in the syringe. Mix competitor (e.g., CD45.1+) and test cells (CD45.2+) in 1:1 HSC equivalent ratio as calculated in step 3.6 and adjust the final volume for 200 µl per injection using sterile PBS. Note: For a group of five recipient mice the suggested volume would thus be at least 1.4 ml, containing 3.5 x 106 competitor bone marrow cells (or 973 estimated HSCs for Sample A in Figure 2), and the equivalent number of test cells (in Figure 2, the equivalent for Sample B would be 197,826 x 7 = 1,384,782 bone marrow cells). Warm up the recipient mice irradiated in step 1.2 with a red heat lamp to ensure dilation of the blood vessels and to make the lateral tail veins more visible. Prepare a 1 ml tuberculin syringe equipped with a 27 G needle (or smaller). Aspirate approximately 750 µl of the prepared cell suspension (for 3 recipient mice). Make sure there are no air bubbles in the syringe. Insert the mouse into a restraining device. Examine the tail and look for the lateral tail veins that should be clearly visible on both sides of the tail. Wipe the injection site with ethanol. Insert the needle bevel up, parallel to the skin and gently press the plunger. Injection should be easy. If force is required, the needle is not in the vein. Note: Older mice have thicker skin, which may make finding the vein more difficult. If the needle is not in the vein, reinsert the needle proximal to the initial injection site. Remove the needle and press the injection site with sterile gauze for a few seconds to stop bleeding. Transfer the mouse into a clean cage. Note: Use the same syringe and needle for three injections, after which the needle may become too dull. For post-transplant follow-up, inject 1 ml sterile PBS subcutaneously to rehydrate the mice for the first five days. Add antibiotics in drinking water to prevent infections (if required; optional). Weigh mice every two to three days for the first three weeks and euthanize mice that have lost more than 15-20% their pre-transplant body weight (or as determined by the local animal ethics committee). Collect a drop of blood (approx. 50-100 µl) into EDTA tubes. To collect blood from the mandibular vein, use a lancet or a 22 G needle to pierce the facial skin near the hairless spot located under the jawbone and place the collecting tube to receive the drop of blood13. Collect blood at 4, 8, 12 and 16 weeks after transplant to follow multi-lineage reconstitution. Add 1 ml freshly prepared RT red blood cell lysis buffer (9 parts 0.16 M NH4Cl + 1 part 0.17 M Tris-HCl pH 7.65) to the drop of blood collected in step 5.1.1. Mix and transfer sample to a 5 ml round-bottom polystyrene tube suitable for flow cytometry. Let stand for 4 min at RT. Add 4 volumes of ice-cold PBS. Mix by turning end-to-end and transfer immediately on ice. Centrifuge 10 min at 200 x g at 4 °C. Decant supernatant and resuspend pellet by flicking. Supernatant should be clear and red. Add 2 ml staining buffer and vortex briefly. Centrifuge 5 min at 200 x g at 4 °C. Decant supernatant and resuspend pellet by flicking. Proceed with flow cytometry staining using the general protocol detailed in steps 3.1 to 3.3 and the following antibodies for the master mix: CD45.1, CD45.2, CD3e, CD19, GR1. Acquire the cell samples using a flow cytometer with at least six detectors9. 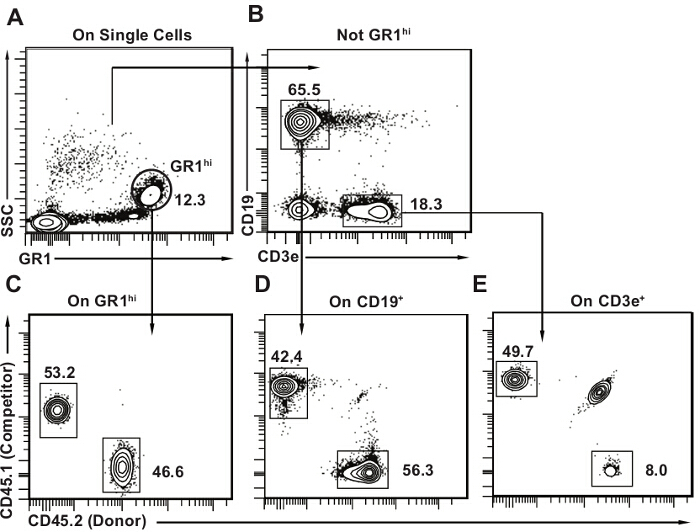 Determine the frequency of donor-derived cells for each lineage (CD19+ B lymphocytes, CD3e+ T lymphocytes, GR1bright granulocytes) in each sample using the analysis template provided in Figure 3 and as published10,11. Collect bone marrow cells as detailed in section 2. Stain the cells for flow cytometry analysis using the general protocol detailed in steps 3.1 to 3.3 and the following antibodies for the master mix: Lineage cocktail, Sca1, CD117, CD135, CD150, CD45.1, CD45.2. Detect lineage cocktail antibodies using fluorochrome-conjugated streptavidin as described in step 3.4. Acquire cell samples using a flow cytometer with at least eight detectors9. If only six are available, add CD135 to the same channel as lineage panel as CD135+ cells will be excluded. Determine the frequency of donor-derived Lin- Sca1+ CD117+ CD135- CD150+ HSCs in each sample using the analysis template provided in Figure 4 and as published10. A general description of the competitive transplant setting, including secondary transplants (discussed further below) can be found in Figure 1. A representative analysis for pre-transplant bone marrow HSCs can be found in Figure 2. More detailed information on the exclusion of doublets and dead cells can be found elsewhere9. Figures 3 and 4 provide examples of flow cytometry analysis templates for peripheral blood and bone marrow, respectively. It is normal to detect some host T lymphocytes (up to 20% of all T cells; Figure 3B), as T cells are more radio-resistant. Competitor-derived cells should be present in all three lineages. The detection limit depends a lot on the number of total cells acquired for analysis, but in our experience a total of 20 thousand cells within the single leukocyte gate is usually sufficient. Using an arbitrary threshold of 1% or 0.5%, if donor cells represent a lower proportion than the cutoff in any given lineage (B lymphoid, T lymphoid, or myeloid as shown in Figure 3), the mouse is not considered positive for multilineage reconstitution. This concept becomes important when the competitive transplants are combined with a limiting dilution assay to quantify donor HSCs as explained in the discussion. It is certainly possible to have, for example, donor-derived T and B lymphocytes but gradual loss of myeloid cells, which would usually suggest only transient reconstitution. Lymphocytes have longer half-lives than myeloid cells (particularly Gr1hi SSChi granulocytes/neutrophils) and can persist even in the absence of bone marrow HSCs10. Figure 5 depicts representative results for peripheral blood chimerism under different situations. 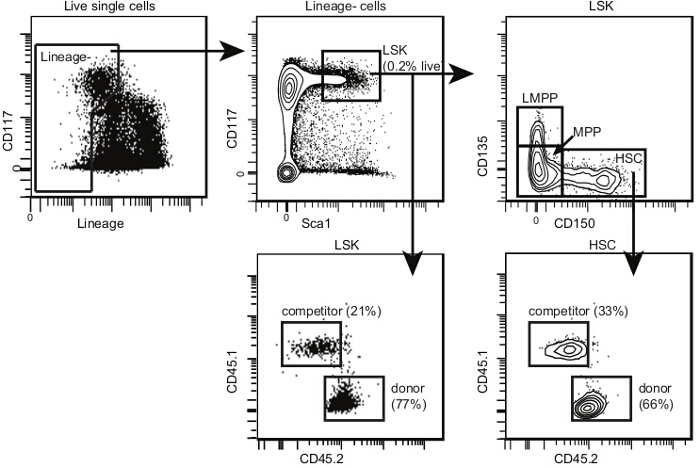 When donor HSCs are functionally equivalent to competitor cells, the proportions of donor (CD45.2+) and competitor (CD45.1+) -derived cells are equivalent (Figure 5A). The residual host cells (CD45.1+ CD45.2+) in Figure 5A and 5B are almost exclusively T lymphocytes as they are more radio-resistant. When donor cells present a much lower proportion of peripheral blood leukocytes (Figure 5B), some aspects of HSC function are likely defective and further studies are needed as described in the discussion. The presence of competitor cells confirms that the assay worked well but donor bone marrow was simply less effective. This is in contrast to the result presented in Figure 5C, where both donor and competitor cells are present in low numbers and host cells represent the majority of peripheral blood cells. In this case the transplant was unsuccessful and it is not possible to draw any conclusions as to the relative functionality of donor versus competitor cells. Different solutions are discussed further below. Figure 1. Experimental design. (A) For a competitive transplant, bone marrow cells from donor mice (CD45.2+; C57Bl6 background; control and test) and congenic competitor mice (CD45.1+; B6.SJL) are mixed in a 1:1 ratio and injected into the tail vein of irradiated recipient mice (CD45.1+ CD45.2+; F1 progeny of C57Bl6 x B6.SJL breeding pairs). The efficacy of bone marrow reconstitution is determined in peripheral blood (PB) at 4, 8, 12 and 16 weeks post-transplant and in the bone marrow at 16 weeks after transplant or later. (B) To further evaluate the self-renewal of transplanted cells, bone marrow cells recovered from transplant recipients after 16 weeks can be transferred into irradiated secondary recipient mice. HSC, hematopoietic stem cell; MPP, multipotent progenitor cell; LMPP, lymphoid-primed MPP. Please click here to view a larger version of this figure. Figure 2. Pre-transplant bone marrow HSC analysis template. Within single cells, select HSPCs according to cKit (CD117) and Lineage expression. Within the Lindim/- cell population, select the cKitbright Sca1+ population (LSK). Within LSKs, select CD150+ CD135- HSCs. This population contains both long-term and short-term repopulating HSCs (the frequency of a repopulating cell within this population is between 1/3 and 1/5). The estimated frequency of bone marrow HSCs is calculated by dividing the number of events in the HSC gate by the number of events in the single cell gate. Please click here to view a larger version of this figure. Figure 3. Post-transplant peripheral blood analysis template. (A) Within single cells, select first GR1bright SSChi granulocytes. (B) Then select CD19+ CD3e- B lymphocytes and CD3e+ CD19- T lymphocytes. Mouse peripheral blood contains a large proportion of lymphocytes, with B lymphocytes being the major cell type (approximately 50% all peripheral blood cells). C-E) Draw 2D flow cytometry plots for each subset with CD45.2 on one axis and CD45.1 on the other. Identify donor (CD45.2+), host (CD45.1+ CD45.2+) and competitor cells (CD45.1+) for each lineage as shown. It is normal to have some remaining host cells, particularly in the T lymphocyte population as seen in panel E. Please click here to view a larger version of this figure. Figure 4. Post-transplant bone marrow HSC analysis template. Within single cells, select HSPCs and LSKs as shown for Figure 2. Within LSKs, select CD150+ CD135- HSCs, CD150- CD135- multipotent progenitors (or MPPs) and CD150- CD135+ lymphoid-primed MPPs (or LMPPs). The proportion of LMPPs is lower after transplant than in non-irradiated mice. 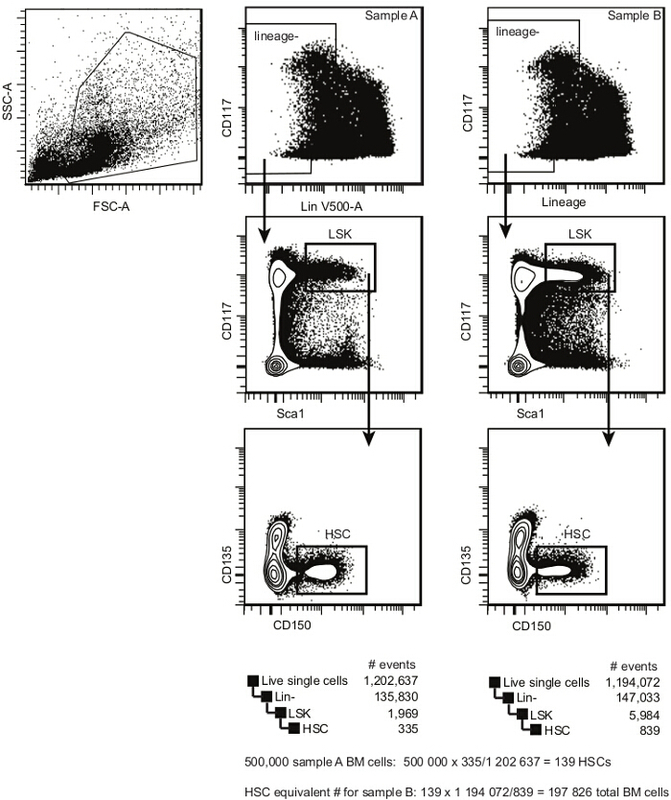 Draw 2D flow cytometry plots for each subset with CD45.2 on one axis and CD45.1 on the other. Identify donor, host and competitor cells for each subpopulation as shown. If the irradiation and transplant are successful, there should be very few remaining host HSPCs. Please click here to view a larger version of this figure. Figure 5. Representative results for peripheral blood chimerism. (A) Successful transplant where donor HSCs are functionally equivalent to the competitor cells. The vast majority of remaining host cells (CD45.1+ CD45.2+) is usually T lymphocytes. (B) Successful transplant where donor HSCs show decreased function as compared to competitor cells. This decreased contribution can be due to several different factors and further analysis will be needed (see discussion). (C) Unsuccessful transplant with low frequencies of both competitor and donor cells and a large proportion of remaining host cells. This type of result suggests a lower than expected dose of irradiation, unsuccessful injection (decreased cell viability, decreased volume of injection, injection outside of the tail vein), or a combination of these. Please click here to view a larger version of this figure. The protocol described here is designed to evaluate the relative fitness of donor (test) HSCs against known competitor HSCs. The situation of competition increases the relative sensitivity of the assay (more likely to detect moderate decreases in stem cell fitness) and provides an internal technical control for the efficacy of irradiation and injection. However, it should not be used as an absolute measure of HSC fitness; a decrease in competitive reconstitution does not automatically mean that the HSCs would not perform well in the absence of competition. Although it can be argued that a competitive setting is the better starting point, as the competitor cells will rescue defective HSC function and all recipient mice will survive, one should be careful with the interpretation of the results. Confirming the results in a non-competitive setting will solidify the conclusions. The experimental design presented here uses HSC equivalent quantities of total bone marrow cells instead of pure populations of flow cytometry -sorted HSCs. It is important to equalize the numbers of HSCs in all populations under study (different donors, competitor) to eliminate variability between different donors and ensure that variations in phenotypic HSC frequency will not be interpreted as alterations in HSC function14. The advantages of the approach described here over purified HSCs are: improved cell viability due to shortened processing times and lack of external pressure during sorting; and improved homing to the recipient bone marrow (the presence of antibodies on sorted cells may interfere with their engraftment in the bone marrow15). Conversely, the main disadvantage is the contribution of non-HSC populations to the transplant outcome, particularly the role of short-lived progenitor cells at early time points after transplant. Furthermore, if the treatment or genetic modification alters the expression of surface markers used for the selection of HSCs16, there may be a significant number of HSCs "in disguise" in one sample but not in another, which will bias the results. However, the same problem may also occur when using purified HSCs and is inherent to the transplant assay. The results obtained using the present protocol are only qualitative at the population level. In other words, a decreased contribution of donor cells after transplant could be due to; a lower number of functional HSCs in the starting population; a diminished ability of the individual HSCs to settle into the bone marrow and expand in the first days and weeks after transplant; or problems with differentiation and growth into mature cells that are used for detection in the periphery. It is thus important to not use the results from a competitive transplant in isolation, but to complement them with assays that will measure cell proliferation, survival, and differentiation from HSC to circulating blood cell. It is also important to compare donor cell contribution between peripheral blood (Figure 3) and bone marrow (Figure 4) Presence of donor-derived HSCs in the bone marrow combined with the absence of donor cells in peripheral blood would be indicative of a differentiation block. Although not shown in the example, it is also possible to assess erythroid reconstitution based on different isoforms of Gpi117. Given the large numbers of erythrocytes present in blood, they represent a highly sensitive method of detection for donor-derived cells, which can be particularly useful when transplanting low numbers of HSCs or following their output over long periods of time. At the other end of the spectrum, myeloid cells are often the first ones to fail being detected, in part because of their low frequency in peripheral blood and in part because of their short half-life. It is possible to adapt the competitive repopulation assay to allow quantification of HSCs using the limiting dilution assay (or LDA). This will require a much larger number of recipient mice divided into several different groups where each group receives a different ratio of competitor:donor cells, either sorted or unsorted as described above. As the number of donor cells decreases, there will be more mice in which the proportion of donor-derived cells does not reach the pre-established threshold in one or several lineages. It is then possible to plot the frequency of "negative" mice per group against the number of transplanted donor cells and determine the frequency of HSCs from the ensuing graph18,19. The suggested duration of post-transplant follow-up varies in the literature. There used to be certain consensus where the period of 16 weeks after transplant was considered to be sufficient to reflect the output of long-term HSCs. However, recent reports of "intermediate" HSCs whose function declines shortly after 16 weeks have underlined the need for even more rigorous evaluation of HSC function17. It is certainly possible to extend the follow-up of the transplant recipients past the 16 week time point to satisfy these concerns. An alternative option, once more with an arguably higher sensitivity, is the secondary transplant (Figure 1B), where bone marrow cells recovered from first transplant recipients are injected into irradiated secondary recipients. The second transplant puts additional proliferative pressure on the HSCs, forcing their exit from dormancy and allowing only cells with robust self-renewal to maintain their output. It is sometimes preferable to use sorted donor cells to better adjust HSC numbers between different samples for the secondary transplants. Alternatively, it is possible to establish an estimated ratio of donor:competitor HSCs from the primary bone marrow (e.g., Figure 4) and then compare the donor cell output in secondary transplants to that ratio. It is also essential to increase the number of transplanted total bone marrow cells, as the frequency of functional HSCs in post-transplant bone marrow never reaches the numbers seen in non-irradiated mice. It is best to pool bone marrow from more than one primary recipient and inject a total of 5-10 million cells per secondary recipient10. As mentioned above, there are a number of reasons for why a given population of donor HSCs may show decreased capacity for long-term reconstitution. One such reason is the ability of HSCs to migrate to the bone marrow after transplant (also called homing) and settle themselves in the bone marrow niche. It is possible to adapt the protocol presented here to investigate bone marrow homing and short-term expansion. It is necessary to increase the number of transplanted cells (the equivalent of 5,000-10,000 HSCs for homing assays and 1,000-2,000 HSCs for analysis within the first week after transplant). In the homing assay, recipient mice are euthanized within the first 16-24 hr after transplant and the number of donor HSCs that have reached the bone marrow is determined as explained in the present protocol. To further evaluate their function, bone marrow cells recovered from the short-term recipients can be transplanted into secondary recipients as explained in Figure 1B. The proportion of donor-derived cells in the secondary recipients can then be used to evaluate the ability of donor HSCs to migrate and settle into the recipient bone marrow. The major problems with the competitive bone marrow transplants arise from irradiation and injection and present themselves as either increased post-transplant mortality or decreased reconstitution efficiency. Split-dose irradiation, as presented here, is usually associated with more efficient myeloablation and less toxicity when compared to single dose20. With the dose recommended here (two times 450 rads), the myeloid and B lymphoid populations are efficiently deleted but residual T lymphocytes do remain (Figure 3). If there is any reason to suspect graft rejection (donor and recipient mice from different genetic backgrounds), a higher dose of irradiation (two doses of 550-600 rads) and a shorter delay between the two doses (4 hr instead of the following day) should help eliminate residual T lymphocytes and decrease the possibility of graft failure due to rejection. Incorrect injection, or injection into the perivascular space instead of the tail vein, problems with donor cell viability, or donor cell contamination due to lack of care during sample preparation will also increase graft failure and post-transplant mortality. Inefficient irradiation (due to technical problems, for example) will result in decreased reconstitution efficiency but should not increase mortality. In all of these situations, the presence of competitor cells in the assay helps to dissociate technical problems (as detailed here) from a bona fide decrease in donor HSC function as the competitor cells should always be able to reconstitute the irradiated recipient. Immunodeficient hosts can also be used, for example, to decrease the need for irradiation and/or risk of graft rejection, and to evaluate the function of human HSCs21-23. In conclusion, we present here a competitive transplant protocol that can be adapted for several different uses as detailed in the discussion. Our approach uses HSC equivalents, which decreases processing times and simultaneously improves cell viability in the graft when compared to cell sorting. It is also a practical solution when access to a cell sorter is limited, and requires fewer mice when compared to the quantitative LDA assay, making it an attractive starting point for the analysis of HSC function. We are grateful to Roxann Hétu-Arbour for assistance with the figure design and demonstration of the procedures. Research in the lab was supported by a Transition award from the Cole Foundation, Discovery grant no. 419226-2012 from the Natural Sciences and Engineering Research Council of Canada (NSERC) and the Canada Foundation for Innovation (CFI Leaders Fund grant no. 31377). KMH is a Chercheur-Boursier Junior for the Fonds de recherche du Québec - Santé (FRQS). Li, H. W., Sykes, M. Emerging concepts in haematopoietic cell transplantation. Nat Rev Immunol. 12, (6), 403-416 (2012). Kiel, M. J., Yilmaz, O. H., Iwashita, T., Terhorst, C., Morrison, S. J. SLAM family receptors distinguish hematopoietic stem and progenitor cells and reveal endothelial niches for stem cells. Cell. 121, (7), 1109-1121 (2005). Kim, I., He, S., Yilmaz, O. H., Kiel, M. J., Morrison, S. J. Enhanced purification of fetal liver hematopoietic stem cells using SLAM family receptors. Blood. 108, (2), 737-744 (2006). Mayle, A., Luo, M., Jeong, M., Goodell, M. A. Flow cytometry analysis of murine hematopoietic stem cells. Cytometry A. 83, (1), 27-37 (2013). Rossi, L., et al. Less Is More: Unveiling the Functional Core of Hematopoietic Stem Cells through Knockout Mice. Cell Stem Cell. 11, (3), 302-317 (2012). Till, J. E., McCulloch, E. A direct measurement of the radiation sensitivity of normal mouse bone marrow cells. Radiat Res. 14, 213-222 (1961). Shen, F. W., et al. Cloning of Ly-5 cDNA. Proc Natl Acad Sci U S A. 82, (21), 7360-7363 (1985). Identification of GM mice. Laboratory Animals. 37, (suppl 1), 33-35 (2003). Rundberg Nilsson, A., Bryder, D., Pronk, C. J. H. Frequency determination of rare populations by flow cytometry: A hematopoietic stem cell perspective. Cytometry Part A. 83A, (8), 721-727 (2013). Abidin, B. M., Owusu Kwarteng, E., Heinonen, K. M. Frizzled-6 Regulates Hematopoietic Stem/Progenitor Cell Survival and Self-Renewal. J Immunol. 195, (5), 2168-2176 (2015). Heinonen, K. M., Vanegas, J. R., Lew, D., Krosl, J., Perreault, C. Wnt4 enhances murine hematopoietic progenitor cell expansion through a planar cell polarity-like pathway. PLoS One. 6, (4), e19279 (2011). Oguro, H., Ding, L., Morrison, S. J. SLAM family markers resolve functionally distinct subpopulations of hematopoietic stem cells and multipotent progenitors. Cell Stem Cell. 13, (1), 102-116 (2013). Golde, W. T., Gollobin, P., Rodriguez, L. L. A rapid, simple, and humane method for submandibular bleeding of mice using a lancet. Lab Anim (NY). 34, (9), 39-43 (2005). Santaguida, M., et al. JunB protects against myeloid malignancies by limiting hematopoietic stem cell proliferation and differentiation without affecting self-renewal. Cancer Cell. 15, (4), 341-352 (2009). Czechowicz, A., Kraft, D., Weissman, I. L., Bhattacharya, D. Efficient transplantation via antibody-based clearance of hematopoietic stem cell niches. Science. 318, (5854), 1296-1299 (2007). Zhang, C. C., Lodish, H. F. Murine hematopoietic stem cells change their surface phenotype during ex vivo expansion. Blood. 105, (11), 4314-4320 (2005). Benveniste, P., et al. Intermediate-Term Hematopoietic Stem Cells with Extended but Time-Limited Reconstitution Potential. Cell Stem Cell. 6, (1), 48-58 (2010). Fazekasde St Groth, B. The evaluation of limiting dilution assays. J Immunol Methods. 49, (2), R11-R23 (1982). Louis, I., Heinonen, K. M., Chagraoui, J., Vainio, S., Sauvageau, G., Perreault, C. The signaling protein Wnt4 enhances thymopoiesis and expands multipotent hematopoietic progenitors through beta-catenin-independent signaling. Immunity. 29, (1), 57-67 (2008). Cui, Y. Z., et al. Optimal protocol for total body irradiation for allogeneic bone marrow transplantation in mice. Bone Marrow Transplant. 30, (12), 843-849 (2002). Benz, C., et al. Hematopoietic Stem Cell Subtypes Expand Differentially during Development and Display Distinct Lymphopoietic Programs. Cell Stem Cell. 10, (3), 273-283 (2012). Eppert, K., et al. Stem cell gene expression programs influence clinical outcome in human leukemia. Nat Med. 17, (9), 1086-1093 (2011). McIntosh, B. E., et al. Nonirradiated NOD,B6.SCID Il2rgamma-/- Kit(W41/W41) (NBSGW) mice support multilineage engraftment of human hematopoietic cells. Stem Cell Reports. 4, (2), 171-180 (2015).